Virtual Tour or Interactive Map? Home » Interactive Maps • Virtual Tours » Virtual Tour or Interactive Map? It’s an eternal institutional Web development question – do we develop an interactive map or a virtual tour … or both? The campus is where students will be spending their time, so representing it is often a requirement, and then the question becomes, if the visitor is virtual, what’s best way to tell our story? 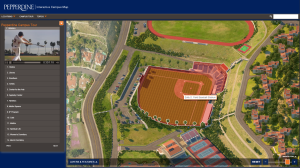 Interactive maps present your visitors with a graphical representation of your campus or location, and allow them to explore by clicking on items on the map. Interactive maps can use any type of base map artwork ranging from simple watercolor maps to 3D Vector Maps to Photo-realistic maps to GoogleMaps. You can bring your existing campus map to CampusTours and have it made interactive, or hire CampusTours to create a new map for you from scratch. Clicking items in the interactive map usually yields a text description, photographs of the location and sometimes embedded videos, panoramas or even Virtual Reality scenes. In some cases, interactive maps also include Guided Tours (see Pepperdine University Guided Tour or Central Michigan University Guided Tour). At CampusTours, we have taken to calling these “Map-Dominant Tours” because the map generally remains the dominant element, and the tour merely appears alongside or in coordination with the map. Interactive maps may contain graphical layers that allow visitors to group buildings by type, place icons around the map to mark locations (emergency call boxes, parking lots, handicapped equipped entrances, etc.) or showcase special events or campus construction. Overall though, the interactive map experience is largely user-initiated and involves sifting through campus locations in search of information. As you might imagine, prospective students often find interactive maps (especially for larger campuses) daunting, and, when many students will research the Web sites of fifteen or more schools, this is entirely understandable. Interactive maps often do contain ways of customizing the map experience to specific audiences. Guided tours are added for prospective students, alumni-specific tours or historic building layers may be added for alumni, and directions between campus buildings or to specific locations on campus from outside of campus are offered for visitors, current students and faculty. 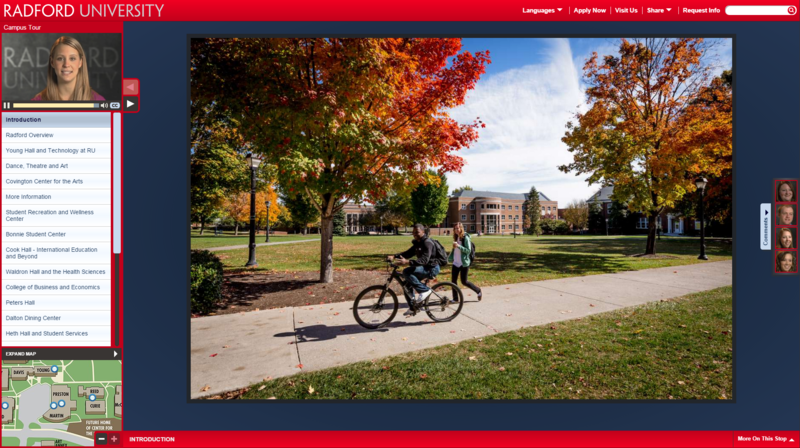 Students indicate that an interactive map is essential once they have winnowed their list and/or are actually making campus visits, but that at the outset of their college search they prefer simple stop-oriented video presentations that give them a better sense for the overall atmosphere, available academic and extracurricular activities and student body at each institution. These stop-based tours may be added to the interactive map, or they may be developed as distinct virtual tours. Many schools have rolled out presentations that invert the emphasis from the campus map to videos, slideshows and panoramic images. These presentations attempt to tell a more cohesive story either through a walking tour approach, or through a series of topical videos. In these virtual tours, the goal is to make the way forward and to content of interest easy to understand for the visitor, so there is less hunting. By switching the emphasis from map locations to topics, programs and general campus life these presentations succeed in making a more direct emotional connection with students, but they require considerable attention on each stop to create the depth of content necessary to allow for reuse and exploration value. Otherwise these virtual tours risk becoming glossy video view books with little or no value after the initial visit. To counter this, organizations must adorn tour stops with additional content (video commentaries, departmental YouTube/Vimeo videos, photos, panoramas, links etc.) so that when a student finds his or her passion, they have the opportunity to delve into it in more detail. Virtual tours are contrasted with interactive maps in the way they attempt to construct a compelling narrative story about the institution. In most cases, virtual tours go beyond explaining what happens in locations on campus and begin to convey student experiences and campus culture. 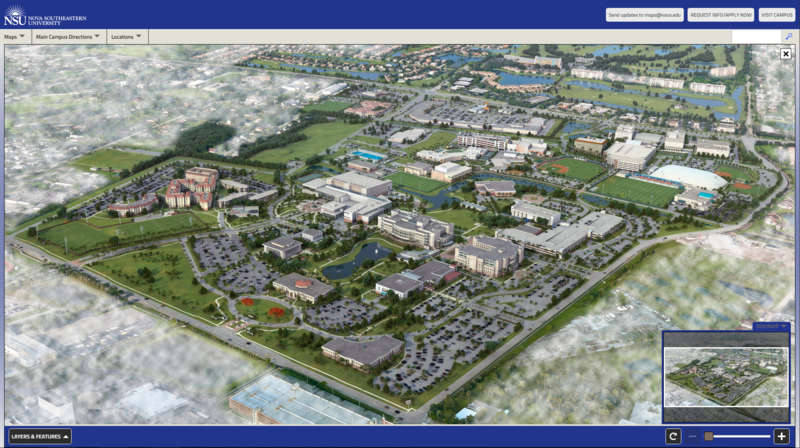 Of course, some virtual tours also use interactive maps to illustrate where particular activities take place on campus. Virtual tours are also capable of being customized to different audiences, and this becomes increasingly important as institutions begin to cater to distinct groups of incoming students ranging from traditional undergraduates to graduate students, international students, continuing education students, commuters, online learners etc. In particular, many schools are now developing foreign language versions of their virtual tour presentations to help them attract and recruit international students. Interactive Map or Virtual Tour … or both? Both virtual tours and interactive maps help your far-flung visitors learn more about your organization. 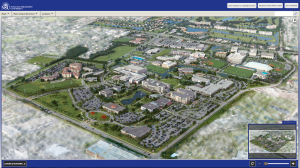 If your institution is starting from scratch it makes perfect sense to begin with the interactive map and develop one that can also include a guided campus tour. Once you have a capable interactive map of campus, you can decide whether you want to create a guided tour based around the interactive map, or whether you wish to step away from the buildings to try to frame your story differently. There is no right answer, and institutions have inevitably taken different approaches in their interactive maps and/or virtual tours. Let us know your personal opinions in the Comments section below!